Stage 4 is the most advanced stage of mesothelioma, and it's the most difficult to treat. However, there are still several treatment options available that can improve quality of life. Palliative treatment options can be used to help stage 4 patients feel more comfortable. When mesothelioma reaches stage 4, it has spread to different areas of the body. Mesothelioma can be difficult to treat once it has metastasized from its point of origin. Stage 4 mesothelioma typically refers to pleural mesothelioma patients. Currently, there isn’t a method used for staging peritoneal mesothelioma. However, specialists may use the TNM staging system and the peritoneal cancer index to get a better understanding of a patient’s disease. A patient with stage 4 is not eligible for some of the more aggressive mesothelioma treatments. Fortunately, there are other treatment options available to help them feel more comfortable, reduce their symptoms, and to help extend their life. More often than not, mesothelioma is diagnosed when it is at an advanced stage. A stage 4 mesothelioma patient may experience more severe symptoms than an individual diagnosed with stage 1, 2, or 3. Stage 4 treatment options help patients manage pain and to alleviate their cancer-related symptoms. 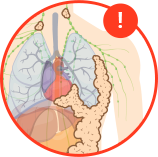 In stage 4 mesothelioma, the patient’s cancer has spread to other parts of the body. In some cases, a patient’s mesothelioma may have spread to other important organs. The extent of a patient’s disease makes it difficult for doctors to perform certain procedures. In many circumstances, stage 4 mesothelioma cannot be treated with more aggressive approaches like surgery. Due to this, a patient’s treatment options may seem limited, but there is still hope. When a patient reaches stage 4, their treatment plan is typically more palliative than curative. The main goal for physicians is to alleviate a patient’s pain and to improve their quality of life by any means possible. Chemotherapy is used to shrink tumors and slow their growth. It can be given in pill form or by an IV. The most effective chemotherapy drugs used to treat stage 4 patients are Alimta and Cisplatin. Patients that experience this chemotherapy drug combination have had an average survival rate of 12.1 months. Chemotherapy is rarely curative on its own, but it may be able to help patients live longer. Radiation is used to shrink tumors and to kill mesothelioma cells. Depending on the location of the tumors, different types of radiation are used. For stage 4 mesothelioma patients, radiation is sometimes used to help relieve pain from tumors. It can also help with improving breathing and managing other side effects a patient may be experiencing from their cancer. Palliative surgeries for late stage mesothelioma patients can improve quality of life while reducing symptoms. Some studies have shown these surgeries improve life expectancy as well. For example, a pleural mesothelioma patient may experience treatment via pleurodesis and a peritoneal mesothelioma patient may be treated with a paracentesis procedure. Both of these surgeries help reduce fluid buildup. Experimental treatments, like immunotherapy, can potentially have stronger effects than standard treatments. Some clinical trials are even formed specifically for treating late-stage patients and patients who didn’t see results from standard treatments. One of the best ways to improve your prognosis and the likelihood of beating mesothelioma is through clinical trials. Clinical trials are currently underway for stage 4 pleural and peritoneal mesothelioma patients. Let our Patient Advocates connect you with top clinical trials for your specific diagnosis. Patients with stage 4 mesothelioma usually have a poorer prognosis than earlier stage patients due to the spread of the cancer. The median life expectancy for patients is around 12 months after their diagnosis is given. Research suggests that individuals with stage 4 mesothelioma have a 2-year survival rate of about 17%. It is important to remember that a patient’s cell type, overall health, age, and gender play a role in their prognosis. It is vital that patients and their loved ones understand that no two mesothelioma cases are alike. Survival rates are just a prediction and they do not define a patient’s story. Discussing treatment options and diagnosis with a mesothelioma specialist will help a patient understand how survival rates apply to them. However, all patients are entitled and encouraged to seek a second opinion. A second opinion is critical in determining a patient’s staging and available treatment options. Late stage patients are often ineligible for life-saving treatments like surgery. It is extremely important that all patients know their diagnosed stage is accurate in order to receive proper treatment. Many patients seek a second opinion from a mesothelioma specialist. From the mesothelioma expert, patients may learn that their original stage was diagnosed incorrectly, which makes them eligible for more treatment options. The best way to check the accuracy of a diagnosis is to get a second opinion from a specialist. Doctors who specialize in treating mesothelioma are much more experienced in diagnosing and staging the disease. Survivor, Alexis Kidd was initially diagnosed with stage 4 mesothelioma because of the metastasis to her diaphragm. Getting a second opinion revealed that her mesothelioma actually originated in her diaphragm and hadn’t metastasized yet. After getting a second opinion, her diagnosis was amended to stage 2. Alexis was given a prognosis of 6-12 months. More than 9 years later she is still alive and well. After her experience, she says, “no one can really predict how much time someone has left.” Read more about Alexis and other survivor stories in our free Mesothelioma Survivor Guide. There are three different systems used for staging a patient’s mesothelioma. The Butchart, Brigham, and TNM System. These staging systems help categorize characteristics of a patient’s cancer. Butchart, Brigham, and the TNM System are usually used to stage pleural mesothelioma. Sometimes the TNM System is used to stage peritoneal mesothelioma. In stage 4, the mesothelioma cells have spread to the bloodstream. The Butchart System recommends palliative treatments to keep the patient comfortable. At this point, tumors may now be present in the liver, brain, bones or other organs. According to the Brigham System, the tumor has grown and metastasized to other parts of the body and cannot be treated any further. Dr. David Sugarbaker is the developer of the Brigham System and is also one of the top pleural mesothelioma specialists. TNM is the most commonly used staging system. During the stage 4 progression, the TNM system states that the cancer has spread to the lymphatic system and the tumor has grown throughout the entire body. How is Malignant Mesothelioma Staged?. American Cancer Society. Retrieved from: http://www.cancer.org/cancer/malignantmesothelioma/detailedguide/malignant-mesothelioma-staging. Accessed: 10/10/18. Gutman, H. (2011). Lung Cancer eBook. Mesothelioma Workup – Staging Medscape Reference. Medscape. Retrieved from: http://emedicine.medscape.com/article/280367-workup#aw2aab6b5b4. Accessed: 10/10/18. Last Edited: November 28, 2018.